Latin text of 395 lines of the Aeneid (608–731: shield of Aeneas; 11.498–596—introduction to Camilla; 11.664–835—Camilla's heroicism and defeat), with same-page vocabulary and notes. These passages introduce episodes that can only enrich and deepen appreciation for and understanding of Vergil's poetic project. Vergil's description of the scenes on shield presented to the uncomprehending Aeneas, and of the heroism and defeat, through trickery and misplaced desire, of Camilla (deemed "Italy's ormanment," by Turnus), when considered side by side, invite readers to scrutinize the relationship, both strained and intimate, between Italy and Rome, and to shed light on Vergil's complex undrestanding of that relationship. This edition also includes a glossary of rhetorical terms and figures of speech mentioned in the passages, a selected bibliography, and a full vocabulary. 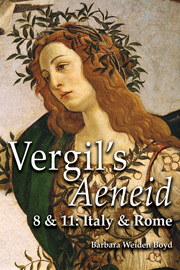 Barbara Weiden Boyd, Vergil's Aeneid 8 & 11: Italy & Rome. Wauconda, IL: Bolchazy-Carducci, 2006. Pp. 102. ISBN 978-0-86516-580-9. $15.00 (pb). Reviewed by Dunstan Lowe, University of Reading (d.m.lowe@reading.ac.uk) Word count: 1178 words ------------------------------- To read a print-formatted version of this review, see http://ccat.sas.upenn.edu/bmcr/2007/2007-01-24.html ------------------------------- This edition of selections from Vergil's Aeneid (the Shield of Aeneas from Book 8 (8.608-731) and the Camilla sequence from Book 11 (11.498-596, 664-835), totaling 394 lines) is designed for high school and undergraduate use. It follows the special format of Clyde Pharr's widely-used edition of Books 1-6,[] like Boyd's recent volume of selections from 1-6, 10 and 12,[] namely the provision of vocabulary (and commentary) on the same page as the text. Boyd's larger volume included all passages on the syllabus for the Advanced Placement course 'Latin: Vergil',[] whereas the book under review, designed as a supplement (p.vii), is for use in other teaching and reading situations by fans of Pharr's presentation style. Whether teachers of Latin choose this edition will depend mainly on their opinion of this pedagogic strategy, but the commentary is well-pitched to its target audience, explaining difficult constructions and never specifically citing other scholarship. Bibliographies by theme offer further reading for studious teachers or students. Pharr's invention of putting text, vocabulary and commentary in parallel on the same page was, and is, intended to save the time spent -- and concentration lost -- in flicking back and forth between pages. He criticized the 'antiquated methods' in use by the majority of editions, believing that parallel vocabulary accelerated acquisition and provided earlier, better access to genuine Latin literature. Pharr's determination to minimize page-turning even extended to the novelty of a fold-out 'extensible sheet' of core vocabulary at the back of the book. The text under review, being far shorter, has a single vocabulary at the back where all page-by-page glosses are collected (and printed with macrons, which are kept out of the main part of the book to allow for scansion practice). A highly experienced teacher of Latin at college level, as well as a Vergilian and Ovidian scholar (whose publications include an article on Aeneid 8), Boyd is eminently qualified to write this book. [] In 1930, Pharr expected high school students to read the entire first half of the Aeneid. Repackaging the poem in smaller pieces is more practical for classes aiming to cover specific passages. If, like Boyd, editors can provide selections which as far as possible contain their own self-contained 'stories', so much the better. The decision to pair passages from Books 8 and 11 in this volume seems arbitrary, worthy though it may be to 'invite scrutiny of the relationship, both strained and intimate, between Italy and Rome' (pvii) by juxtaposing the Shield of Aeneas with the life and death of Camilla. The explanation is probably as follows: selections from 1-6 were already a unit due to Pharr. In order to complete the Advanced Placement syllabus, selections from 10 and 12 were edited in one volume[] and subsequently republished (as mentioned above) with the relevant selections from 1-6. Now that the AP goal has been achieved, two more editions covering 8 plus 11 and (presumably) 7 plus 9 will complete a larger project of editing selections from all twelve books for high school and undergraduate use. Boyd's editions offer several advantages over Pharr's popular but dated textbook. In his Foreword to the 1996 reprint of Pharr,[] Ward W. Briggs Jr. wrote that 'the somewhat simplistic notes must be abetted by a commentary like those of R.D. Williams or R.G. Austin, especially in preparation for the Advanced Placement examination.' Boyd's editions benefit from a more up-to-date text (Mynors' OCT of 1969 rather than Hirtzel's of 1900) and fuller notes than Pharr's, with more comments on stylistic and emotional effects, and brief glosses for all allusions to Roman myth, religion and history, providing much-needed background for passages such as the shield-ecphrasis. All other changes are a matter of taste but generally conform to contemporary trends. Pharr's two typographic innovations are removed. First is the marking of all 'first occurrences' in the vocabulary with daggers (in only four hundred hexameters that would thrust daggers on considerably more than half the words listed). Second is the italicization of all 'extensible sheet' vocabulary (which created a patchwork of regular and italic type resembling the King James Bible). Boyd also banishes the consonantal 'j', which has fallen out of favor, while preserving the still-popular consonantal 'v'. The supporting material requires little more from the student than a solid grasp of grammar and grammatical terminology. Such a reader could easily survive outside the classroom, with only a translation to resort to in emergencies. The vocabulary definitions themselves nicely tread the line between being full and being specific to the text. This follows Pharr's policy on vocabulary, which was 'to preserve some mean between a poverty which is barren and a wealth which is confusing to the student who is trying...both to read Vergil and to learn Latin. '[] In practice, this means (briefly) listing the principal meanings, but giving first the meaning in that particular context. The result sometimes looks a little odd, with first definitions given including 'celestial' for caerul(e)us (p.3 & p.15), 'stroke' for fingere (p.7) and 'harden by heat' for coquere (p.35), and, since the vocabulary at the back includes latrator but not latrare and pavitare but not pavidus, the book clearly aims to teach the Latin of these 392 lines first and Latin as a language second. But this method is on the whole highly successful, giving exactly the same range of meanings wherever the same word is glossed. [] This book will of course require a teacher to bring out its full benefits. Touches of contextualizing color, for example the comparison of Romulus' hut(s) to the humble monument of President Lincoln's log cabin (p.11), are only occasional. Perhaps because it is a supplement, it assumes a working knowledge of grammatical, syntactical and prosodic terms (e.g. p.39 'proclitic', p.39 'apodosis', p.44 'syncopated'), though a glossary of stylistic terms is provided. Stylistic flourishes are indeed a favored point of comment, and sometimes the commentator seems at pains to work them in (11.583 is 'an unusual four-word hexameter' if we discount et, p.39; 11.589 is 'a virtual Golden Line', p.40; incumbens eminus (11.674) is 'almost an oxymoron', p.43). Boyd's intention is to point out Vergil's art but only in an 'open' and 'suggestive' way (p.xi). The duty of the teacher -- apart from using tests to make sure that students actually learn vocabulary, instead of looking at the bottom of the page most of the time -- is to encourage the habit of explaining e.g. how and why stylistic features are 'striking' (e.g. p.5 on 6.626-8, p.9 on 6.649). Otherwise they will think that identifying figures of speech and rhetorical terms, in which Boyd is so helpful, is an end rather than a means. The commentary is well-balanced, and the pettiness of my quibbles attests to its reliability. [] This is an inexpensive and user-friendly edition designed to get students reading the Aeneid as early and rapidly as possible, with few errors[] and plenty of contextualizing information about the poem as a whole and its culture. It is bound to prove popular as part of Boyd's range of selections from the Aeneid, which revive Pharr's method for contemporary use. ------------------ Notes: 1. Pharr, Clyde, Vergil's Aeneid (Books I-VI). Boston, MA: D.C. Heath & Company, 1930. 2. Boyd, Barbara Weiden, Vergil's Aeneid: Selections from Books 1, 2, 4, 6, 10, and 12. Wauconda, IL: Bolchazy-Carducci, 2003. ISBN 0865164819. 3. For more information on the Advanced Placement scheme, in which Canadian and North-American high school students can earn college and university credit, see the AP website (http://www.collegeboard.com/student/testing/ap/about.html) for students and parents (accessed August 27th 2006). Boyd has nine years' experience serving on the AP Latin Test Development Committee. 4. Boyd, Barbara Weiden, 'Virgil's Camilla and the Traditions of Catalogue and Ecphrasis (Aeneid 7.803-17)', American Journal of Philology 113 (1992) 213-34. 5. Boyd, Barbara Weiden, Vergil's Aeneid 10 & 12: Pallas & Turnus. Wauconda, IL: Bolchazy-Carducci, 1998. ISBN 0-86516-415-0. 6. Pharr, Clyde, Vergil's Aeneid (Books I-VI). Wauconda, IL: Bolchazy-Carducci, 1996. pp.vi-vii. 7. Pharr (1930) p.x. 8. The only exception I found was a slightly abbreviated definition of deicio on p39 compared to that of p.41 & p.83. In fact, repeating vocabulary (e.g. caerul(e)us: p.3, p.15, p.22; caedes: p.19, p.21, p.52) is relatively rare. 9. Very minor complaints: the definition of anastrophe on p.31 is unnecessary since it has already appeared on p.15. versat at 11.669 (p.42) is oddly interpreted to mean that Eunaeus 'turns over' to conceal his woman-inflicted wound, whereas the frequentative versare must mean 'roll' or 'writhe'. It seems redundant on p.43 to gloss Amastrus, Chromis, Demophoon, Harpalycus, Iapyx and Tereus each individually as 'an ally of Aeneas' since they are collectively called Phrygii viri at 11.677. Finally, while no expert, I think the account of why contorquere is an appropriate verb for launching arrows on p.43 is inaccurate: arrows spin as they fly not because they are twisted by the action of the hand, but because they are fletched. 10. I found only the following: on p.1 read 'white' for 'whiter'; p.21 'pass. inf.' for 'act. inf. '; p.42 'more than a superficial' for 'more that a superficial'; p.69 'onomatopoeia' for 'onomatopoiea'; p.69 'a symmetrical' for 'asymmetrical'; and p.85 'rust color' for 'rust-colored'. Thematic selections from The Aeneid on the intriguing relationship between Rome and Italy.